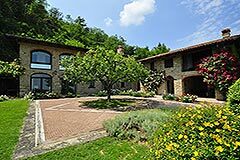 Luxury Property for sale in the Langhe Piemonte Cossano Belbo The Langhe, near Alba, Asti, Nizza Monferrato & Acqui Terme (ref: 8124)- Two Luxury country homes with swimming pool with beautiful vineyard views in the beautiful Langhe region. Piedmont Properties in Piemonte. Property for sale Langhe and Piemonte.